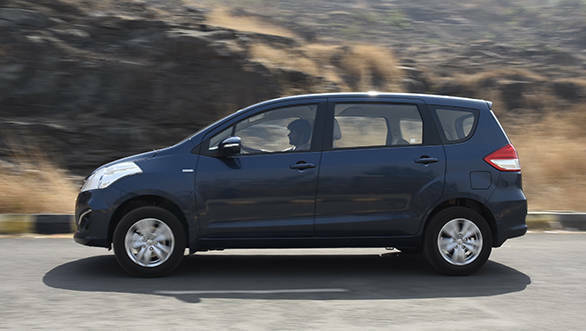 Only one vehicle has managed to bring any form of challenge to the Toyota Innova's dominance of the MUV market in India and that's the Maruti Suzuki Ertiga. While the Ertiga isn't quite as large or spacious, it counters by offering a more size appropriate package for large families living in a big city. The fact that it is considerably more affordable than the Innova is another advantage. 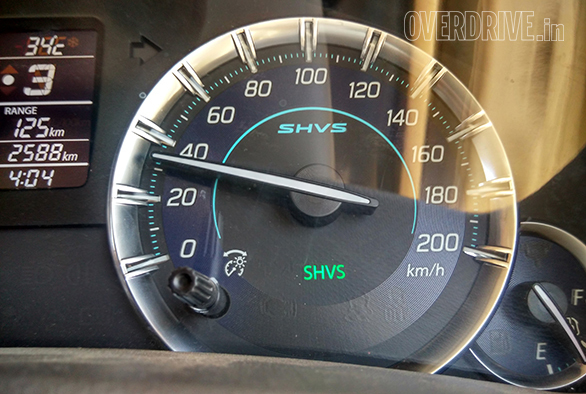 Now, Maruti has upped the game further with the introduction of the its SHVS (Smart Hybrid Vehicle by Suzuki) technology. 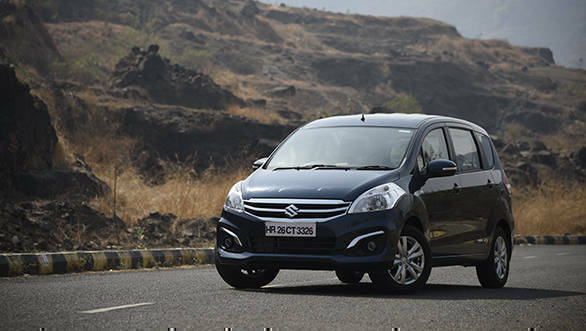 Along with SHVS, Maruti Suzuki has also given the Ertiga a routine facelift and mild upgrade. Let's see what's what. The exterior changes are your typical facelift affair - a new grille and bumpers and a fresh alloy wheel design. Not much has changed on the outside and the Maruti Suzuki Ertiga SHVS ZDi still carries forward it's unusual, Japanese themed design with large headlamps, a long body and a squared off rear end. The cabin sees fresh upholstery fabrics and and brand new and smart looking TFT touchscreen display unit. Like the Ciaz, this one supports MirrorLink which allows some of the features on a paired smartphone to be displayed on the screen. Audio connectivity options include USB, AUX and bluetooth connectivity. Steering mounted controls add to the usability quotient. Sound quality is quite alright but audiophilles will want to swap out the four speakers for something a little higher spec. The screen doubles up as a display for the reverse camera on our top ZDi model and also offers GPS navigation although experience shows that, like with most cars, you'd be better off just using Google maps on your phone. 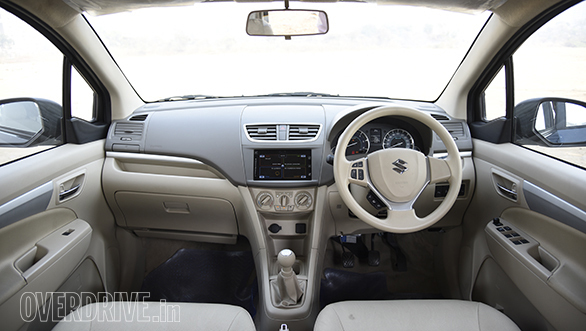 Maruti continues with a manual aircon in the 2016 Ertiga and in the strong heat we're facing these days, I found that it takes at least fifteen minutes to cool the cabin. Perhaps this is down to the sheer size of the vehicle and I found that turning on the separate middle row aircon helps speed up the process. Another appreciable feature is that the rear seats now fold in a 50:50 split. The third row also drops flat to liberate storage space but you will need to take off the headrests to allow this. The 60:40 middle row is really flexible and can slide forward or back or also be reclined. Space in the middle is great but the rear is best for kids. 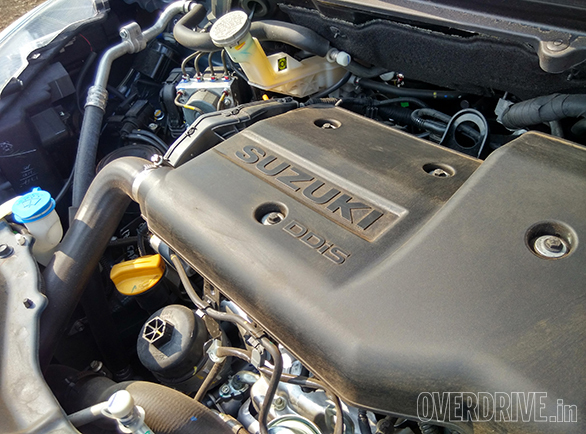 While Maruti Suzuki haven't made any significant changes to the 90PS, 1.3-litre diesel engine itself ,the big addition comes in the ISG or Integrated Starter Generator. This one device is what essentially constitutes the SHVS system. In simple terms, this device acts as a starter motor for the engine, allowing repeated starts and stops through the new start-stop feature. However, there's more to it. The ISG also collects energy that is usually wasted under braking and when the vehicle is coasting. It sends this energy to a new, high capacity battery. The same energy is then used by the ISG for its start stop function and also as a torque assist to the engine when under load. So, to sum up the SHVS system brings to the table a start-stop function, energy regeneration through braking and coasting and also a torque assist system. There's also a gear position indicator on the dashboard. 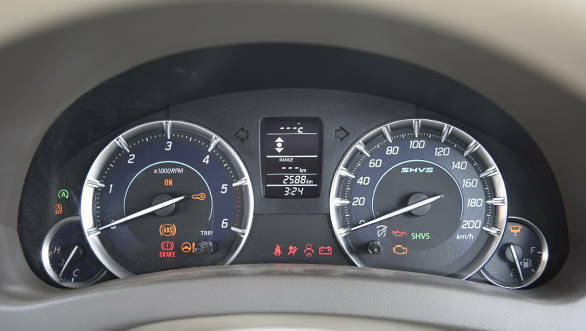 The start-stop system can be deactivated by a button and a little green light in the dash lights up whenever the SHVS system is functioning. Of all the above features, the torque assist is most interesting. After all, the latest hypercars like the McLaren P1 use their electric motors to provide a similar concept of torque assist while the turbos in the engine spool up to produce mind altering levels of performance. Of course this is a family car we're talking about so the effect is going to be much, much milder. Truth be told, there isn't much perceivable effect while accelerating in lower gears and seeing the green SHVS light flashing. If it is in fact sending any extra torque to assist acceleration, I couldn't really feel it. Then again, Maruti is clear that the system has been calibrated solely for the sake of boosting economy and added performance was never a concern. The start-stop system works perfectly. The engine cuts off when you shift into neutral at a standstill and turns back on after a minute or so to keep the aircon and other electrical running. When the engine is off there is a noticeable drop in AC temperature and the air coming out of the vents goes from cold to cool. The engine springs to life quickly, albeit with a slight judder the moment you depress the clutch. However, a few of my colleagues said that they will prefer if the SHVS system could warn them before turning the engine off as this will help immensely in stop-go traffic. Marut claims a significant 18 per cent increase in efficiency with the SHVS system. Our tests reflect a jump up too, particularly in city where the SHVS system could really do its thing. We recorded 15.1kmpl in city and 22.9kmpl on the highway. The Ertiga stays efficient on the highway at a realistic cruising speed of 100-120kmph, returning about 17kmpl. With a gentle foot, a range of over 700km on a full tank of diesel is easily achievable. Performance is up to the job and the Ertiga definitely feels quicker than an Innova but not quite as quick as the Mobilio. The Multijet engine isn't very linear and there is a fair bit of lag before a strong surge arrives above 2,000rpm. The lag is an issue for overtakes but in bumper to bumper traffic the car tracts ahead when you get off the decently weighted clutch. The gearing has been selected to allow for this tractability and the Ertiga can crawl over speed breakers in second gear without complaints. I clocked over 1,000km on the Ertiga over the weekend and discovered that above all, it is an easy and stress free car to drive. 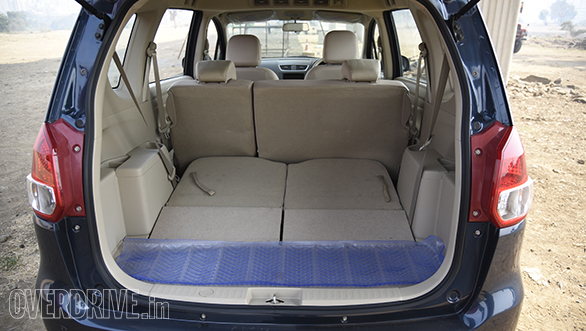 The Ertiga's chassis has a firmness to it that I like. It is supple enough to absorb bumps but never feels soft or wallowy. 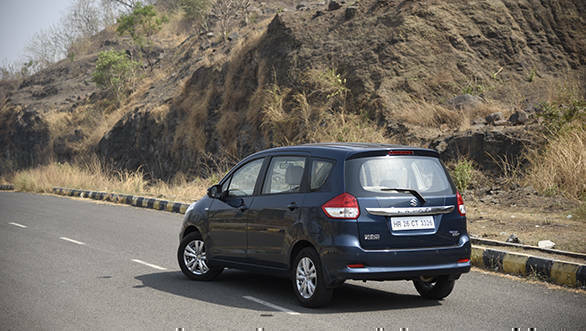 As a result, highway composure is good and the Ertiga remains a neutral handler with good levels of grip. What I particularly liked was how easy the Ertiga is in town. A short front overhang and a reasonably tight turning radius make u-turns and parking in tight spots easy. 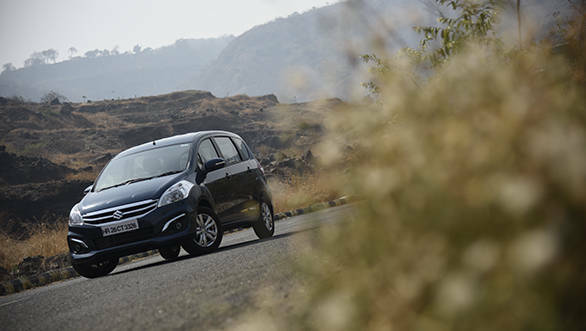 As a city car, the Ertiga never feels too big or cumbersome. SHVS technology is undoubtedly the star in this model upgrade but the Ertiga also benefits from more comfort and added features. Safety has also been given priority and while this top model has dual airbags and ABS as standard, customers can opt for ABS as an option right from the base model. A driver airbag is also standard across the range. The 2016 Ertiga then isn't a game changer but simply reinforces its position in the market. With the all-new Innova coming in at an even higher price and the Mobilio still awaiting its much needed cabin facelift, the Ertiga finds itself in the right place at the right time.